Innermedia > Latest News > Website Designs > Responsive School Website Launched! 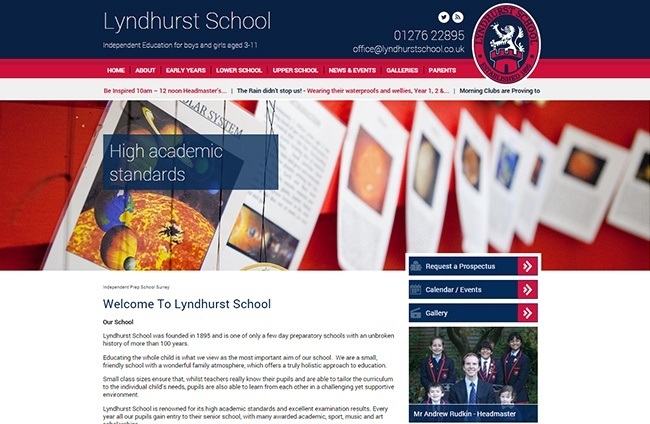 We’re delighted to say that we’ve recently launched Lyndhurst’s new website. The school transferred their site to us because they weren’t happy with their current content management system. The CMS was very limited and didn’t allow them full control over their website; the design of their existing website was modern so we just added a few more features to make it more user and device friendly. or a policy needs to be updated to a few different areas of the site. As part of our update, we also made the site responsive. Our school sites receive 40-50% of their traffic from mobiles, which is why it’s imperative that these sites work quickly on 3G/4G and the navigation is optimised for mobile devices. We’ve also built a school app for them to separate traffic from existing parents and provide them with a way to find information they need quickly and easily. Our apps provide a 1-touch way to find policies, school menus, and other key documents.